Tycho's Supernova Remnant: The hot, expanding debris of a supernova observed in 1572. 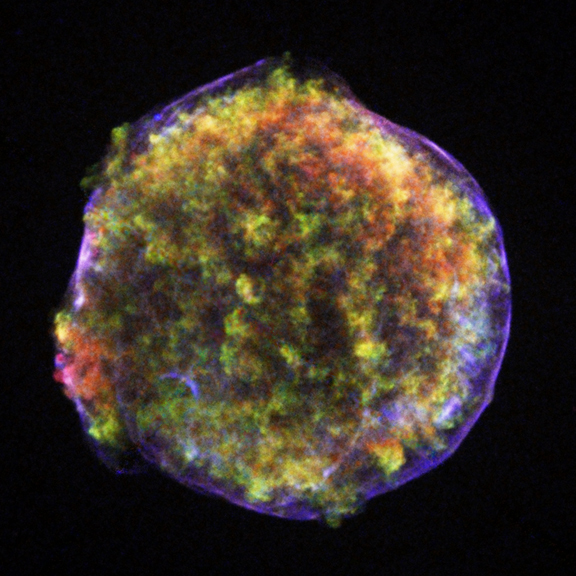 Caption: The Chandra image shows a bubble of hot gaseous supernova debris (green and red) inside a more rapidly moving shell of extremely high-energy electrons (blue). These features were created as the supersonic expansion of the debris into interstellar gas produced two shock waves - one that moves outward and accelerates particles to high energies, and another that moves backward and heats the stellar debris. The relative expansion speeds of the hot debris and the high-energy shell indicate that a large fraction of the energy of the outward-moving shock wave is going into the acceleration of atomic nuclei to extremely high energies. This finding strengthens the case that supernova shock waves are an important source of cosmic rays - high-energy nuclei which constantly bombard Earth.